I recently finished up my season in Alaska and wanted to reach out to everyone and give a report on my experiences guiding in Bristol Bay. I worked with Bristol Bay Lodge, one of the premier lodges in Alaska. Bristol Bay Lodge is located on Lake Aleknagik in the Tikchik region of Bristol Bay. It is about an hour drive followed by a 40-minute boat ride across to the far end of the lake to get to the remote lodge. It is built in one of the most beautiful places I have ever been and strategically located to fish the local waters and offer fly outs to the other fisheries we utilize. During the first part of the season I was a guide on the local fisheries the Agulukpak, Agulowak, and Sunshine creek. The Agulukpak is a daily fly out and just 15 minutes in the air from the lodge gets you to our boats we have stashed on the beach. This short river is one of the top ten trout streams in Alaska. In one day of fishing guests could utilize many different techniques to catch big leopard rainbows and oversized grayling. My favorites were swinging streamers and skating mice and my guests seemed to like it too. This was a good way to target the biggest rainbows. If you want to put up big numbers nymphing usually provided guests with 20-50 fish days. In addition to the rainbows and grayling the lake mouth offered excellent Char fishing and later in the year the char follow the salmon into the river to eat the eggs. The lake also offers good pike fishing and often times we would get guests all 4 species of fish in a day! The Agulowak is about a 10-minute boat ride to the mouth of the river from the lodge. 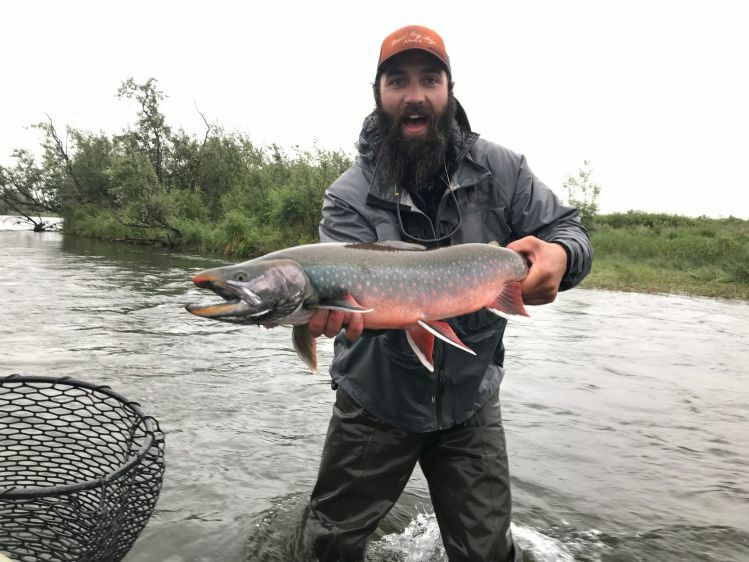 In the early season this river offers the best Char fishing in all of Alaska, Lake Aleknagik has the largest population of Arctic Char in Alaska and in June they congregate at the mouth of the river to feed on the millions of salmon smolt that are trying to return to the ocean. Char up to 8 pounds are common and when it’s on you will catch a lot of them! The river itself is deemed one of the best dry fly rivers in Alaska and can offer spectacular fishing on the surface. The average size of the rainbows and grayling is smaller than the Agulukpak but the sheer number of trout in the system is incredible. Sockeye salmon fishing is great in this clear water and makes sight fishing for them a riot! You can catch your limit and head back to the lodge or stay out all day and fish for trout after your guide cleans your fish. The dolly varden follow the sockeye up and when the sockeye begin to drop eggs you can expect to catch 50-100 fish between the dollies, char, trout, and grayling in a day! In the early season guests can go out after dinner to night fish per request. These were some of my favorite nights going up to target large rainbows on flesh flies or go over to “airplane bay” and have guests strip flies for aggressive pike on the lake. Sunshine Creek is a small river about 15 minutes from the lodge and is fun to ride up in a jet boat. This creek offers great dolly varden fishing in late summer and into the fall. You can also find a few kings, chums, and silvers around. In late July I was able to go guide out at one of our camps – Rainbo Camp. This is a remote river camp set on the edge of the Bering Sea in tidewater and is exclusively fished by us. You will not see another person on this stretch of river except your buddies you are fishing with or the other guide boat. During your stay at Bristol Bay Lodge you will utilize this camp for one night and one full day of fishing. The accommodations are weatherport tents with doors and inside they have two comfortable beds on bed frames. The cook tent has a shower and flush toilets. The food is more than good and fulfilling after a day of fishing. This camp is often the highlight of the entire week for guests. When I was there the Dolly fishing was incredible! We were catching 50 or more a day and many of them were between 22-26 inches, the biggest one of my season was a brightly colored 34” male. After about 2 weeks of consistent fishing for them the average size of fish drops to 18” as the biggest of the fish move far up the river to spawn. 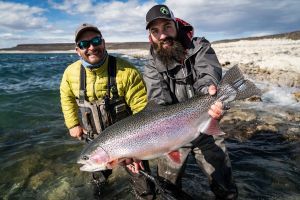 The rainbow fishing can also be good at rainbow camp although there aren’t a ton of them the average size we catch are usually over 20” with some stretching to 30” or better. These rivers are small and the amount of logs and jams can make it a challenge to land one of these heavy hard fighting rainbows. Though the dolly and trout fishing is good, the real prize of Rainbo Camp is the salmon fishing! Since we are located on the tidewater when the salmon begin to make the journey up the rivers we are right there to catch them fresh from the ocean. This makes them harder fighting and the best possible table fare. I was there for the heart of silver season and I have never seen anything like it. Guests loved fighting these 10-12 pound chrome rockets that were ready to crush a pink streamer. Some days when we got big pushes of fresh fish we could land 50 or more silvers per guest! These two rivers also have great king fishing and it is a good place to try and swing one on a fly rod. You can also spin fish for them or strip streamers. The rivers get a good run of large chum salmon, sockeye salmon and pink salmon. The two other rivers the lodge fishes that I haven’t mentioned are the Togiak and the Goodnews River. I did not guide these rivers but had the opportunity to fish them. The Togiak is a large river with many small tributaries. This river offers great king, chum, pink, trout, and dolly fishing. Guests fly out to Togiak for the day and land on the river near a gravel bar. We have guides and boats waiting for your arrival. After the day fishing you go to Birch Camp to spend the night. This camp is located way up the Middle Fork of the Goodnews River. Bristol Bay Lodge operates on an exclusive lease and are the only ones allowed to run jet boats in this section of river. From time to time you will have a rafter float by but most days it will just be you and your guide out there. This river fishes great for kings, sockeye salmon, trout, and record sized grayling. Similar to Rainbo Camp you will spend a day and night fishing here. The Lodge is newly renovated in 2018 but still has a rustic Alaskan feel about it. The guest accommodations are 5-star complete with a hot tub and wood fired sauna. Depending on group size guests can stay in one of the rooms within the lodge or in one of the cabins located on the property. The views from the dining room are great as the lodge overlooks the lake and the food itself is better than most of the fancy restaurants in downtown Anchorage. The guides, pilots, house staff, and general manager Steve Laurent work hard to make your experience in Alaska an unforgettable adventure. This next season in approaching fast and the good weeks are becoming slim at the best Alaska fishing lodges.